ANA, Japan’s largest airline, announced today that it will reveal a new Star Wars themed aircraft, adding to its fleet of three existing planes that have Star Wars characters as livery. 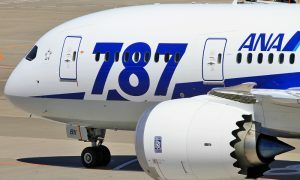 All Nippon Airways will introduce the C-3PO ANA JET with the iconic C-3PO on its Boeing 777-200, as part of the previously announced Star Wars Project, a five-year agreement with The Walt Disney Company. All Nippon Airways launched the Star Wars Project in April 2015 after signing a five year contract for the Star Wars brand with The Walt Disney Company. 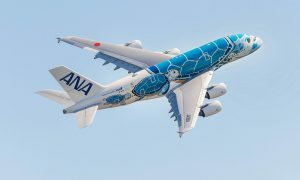 The partnership also means ANA is the first and only airline in the world to fly the special livery aircraft featuring Star Wars characters on the exterior of the actual aircraft. The Star Wars livery is in line with the airline’s strategy to further enhance its international presence. With demand increasing around the world for flights to Japan, ANA is committed to raising the profile of the ANA brand in the global market through innovative partnerships and branding opportunities. All Nippon Airways is the largest airline in Japan by revenues and passenger numbers. Founded in 1952, ANA flies today on 83 international routes and 116 domestic routes. The ANA group has 35,000 employees and a fleet of about 250 aircraft. The partnership with Star Wars, beloved by audiences in Japan and around the globe, is a perfect match as Japan’s largest airline seeks to connect travellers around the world through this project.